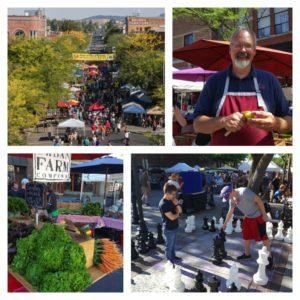 Our festival is located in Moscow, Idaho, and there are lots of things to do in our area! So much to do to make the weekend a full experience! In addition to the activities below, kids can join us for Rendezvous for Kids – an arts festival in the park on Thursday and Friday of festival week. Summer on the Palouse is a beautiful time of year! Mountain biking, hiking, and swimming are popular activities for locals and visitors alike. Bring your own bike, or rent a bike from one of our local bike shops, and ride the Latah Trail (a paved trail) or off-road trails on Moscow Mountain. 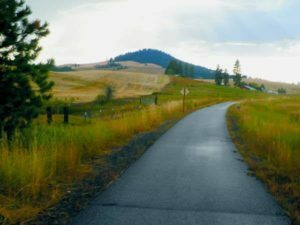 The Latah Trail offers paved cycling and walking from the Washington border through Troy, Idaho. On Saturday of the Festival, cycling enthusiasts can participate in “Fondo on the Palouse“, an epic bike ride with routes ranging from 15 to 100 miles long. (Bonus! Fondo participants can geta ticket discount to Rendezvous! Boating on the Clearwater and Snake rivers is another popular activity. For beach time, Boyer Park and Marina is a popular destination for boaters and swimmers alike. Another swimming option, The Hamilton Aquatic Center is a public pool in Moscow — with water slides, lazy river, concession stand, and diving boards. The Moscow Farmer’s Market offers live music, food and craft vendors. For many locals, it is theplace to be on Saturday morning. Another option to enjoy the sunshine is the frisbee golf course at the University of Idaho. Traditional golfers can choose from courses at the University of Idaho, Washington State University and Bryden Canyon (in Lewiston), all within 30 minutes of Moscow. And, for those who like to hike, the area offers a number of options for a variety of abilities. Idler’s Rest and the University of Idaho Arboretum have easy access trails. A bit further afield, Kamiak Butte rewards hikers with amazing views of the Palouse. Moscow is home to the University of Idaho. On campus, the Student Recreation Center is home to the second tallest climbing wall in the US. Wild @ Art is a local business that offers paint-your-own ceramics. Stop in, get creative, and follow that up by a walk down Moscow’s vibrant Main Street and visit the numerous shops. From books, to art, to clothing & outdoor gear, to toys…you name it and you’re likely to find it downtown. The Prichard Art Gallery, an outreach by the University of Idaho, is located downtown and serves up a year-round schedule of exhibits. Just south of us lies the Lewis-Clark Valley, America’s newest viticulture area (AVA) and there are numerous wineries to visit for tasting. Additionally, there are a number of microbreweries and tap houses for aficionados in the downtown area. Stop by for a pint and maybe a snack. Try Tapped, Rants and Raves, Hunga Dunga, Moscow Brewing Co. or the Moscow Alehouse.